Consider hiring a personal care aide if your loved one needs human assistance to safely perform Activities of Daily Living like bathing, dressing, transferring, toileting and eating. For people who are frail, ill, or recovering from injury or surgery, the assistance of a personal care aide can prevent problems such as skin breakdown, injuries from falls, malnutrition, social isolation, and loss of dignity. Personal care aides provide needed respite to caregivers and have expertise in how to safely assist their clients. What do I need to know about Personal Care Services? Personal care is distinct from “companion care” or “home helper” services. Companions who are not also personal care aides are not licensed to provide “hands-on” care for personal activities of daily living. However, personal care aides can provide companion services such as light housekeeping and medication reminders. 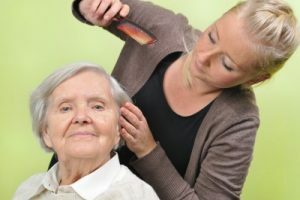 Personal care is distinct from skilled “home health care.” Home health care professionals such as Certified Nursing Assistants have additional training and licensure requirements which qualify them to perform medical tasks which personal care aides cannot. Some agencies provide only one type of care (companion, personal care, or home health) and others provide two or more types. Is the care receiver likely to need related services in the near future: companion/home helper services, skilled home health services, or hospice services? What type of payment are you able to provide, and which agencies or private aides accept that form of payment? Do you have long term care insurance? If so, find out the policy’s requirements for the type of aide that will be covered. Are the personal care services needed as a result of surgery or another short-term illness? Do you want the personal care aide to provide transportation? If so, find out the agency’s policy on driving, and be sure you know the insurance implications. Do you want the personal care aide to help with medications? Virginia law allows both personal care agencies and private personal care aides to administer medications that are normally self-administered by the client. However, each agency and private aide will have their own policies about medication reminders and administration - including filling pill boxes - so inquire in advance. Agencies offering home health services will be more likely to offer medication management services. Agencies certified by Medicare have additional requirements for training and supervision of employees helping with medications. Is a loved one willing or able to manage a staff of caregivers or employ a care manager to do so? If not, a personal care agency is often a better solution than a team of private aides. Agencies are governed by licensing standards; private personal care aides are not. See “What to know about Personal Care Agencies in Virginia” below for details on licensing requirements. Private personal care aides usually only accept private payment for their services. Agencies usually have many different aides employed, making it easier to find a good personal fit for the client and for finding backup aides, but sometimes making it more difficult to ensure the the client has the same aide consistently. In some cases, it works well to combine the use of agency employees and private PCAs. Virginia licensing requires personal care agencies to conform to certain standards including: Criminal records checks of potential employees, and not hiring people who have been convicted of certain crimes. See this guide from the Department of Labor about "Paying Minimum Wage and Overtime to Home Care Workers." Contact your tax professional to understand payroll tax, overtime, and minimum wage requirements. Do not assume the aide is an independent contractor; the vast majority are classified by the IRS as domestic employees. Contact your insurance professional to understand liability insurance and surety bonding implications. Ask about coverage if you experience a loss of personal property, but also be sure to understand your liability if the aide is injured while providing services to you. Consider using a payroll service for domestic workers to handle payroll taxes or insurance. One such company, HomePay, offers this advice about payroll taxes and insurance, and information about myths and mistakes for employing in home caregivers. If you already hire private caregivers, consider enrolling them in a registry like CareFamily.com to take advantage of payroll and payroll tax services and insurance benefits. Ask for documentation that the PCA has attended a training program so they know how to provide personal care safely. PCA classes are typically 40 hours. An example of the curriculum is at this link. Licensed nurses or nurse’s aides providing personal care services will have their licensed listed under the License Lookup service from the Virginia Board of Nursing. Do you need to hire a personal care aide for your loved one, but don't live nearby, don't have time, or would appreciate assistance? Contact Care is There Geriatric Care Management by calling 800.434.1633 or by emailing us at Info@CareisThere.com. We provide a free telephone consultation and will help in any way we can.